We have a group of three couples we call the “French Connection” because two of our friends are French, each married to one of our Mexican friends. We usually have dinner at each other’s house and enjoy a dinner, some vino ( French of course) and lots of laughter. Our ages range from 36-77, and we don’t feel the age differences at all. In November we decided to go to Steinbeck’s restaurant in the Costa Baja Resort Hotel. Here in La Paz on the shores of the Gulf of California ( a/k/a Sea of Cortez) two great men have made an impact, Jacques Cousteau, and John Steinbeck. They are considered local sons. Well we had a wonderful time at dinner. The chef prepared a tasting and wine pairing menu. We were a touch tipsy, and all decided that since the world was definitely (or maybe not) ending in December, we should fore-go Christmas gifts and come back for a dinner, stay in the hotel and have breakfast at the other restaurant, Mosaic. So I wanted to have a smashing outfit for this important occasion. 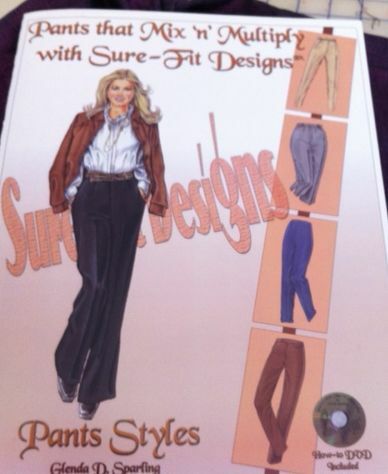 I drafted my first Sure-Fit Designs basic patterns, then using Glenda Spurling’s book, Pants That Mix and Multiply, I made the faced waistband pants. 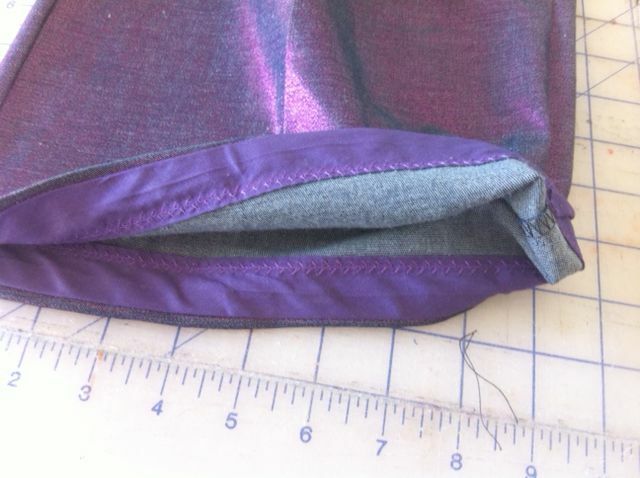 The fabric is a Purple, metallic, stretch, denim. The only stretch fabric I ever buy is knit fabric. But this gorgeous fabric jumped off the table and into my arms. 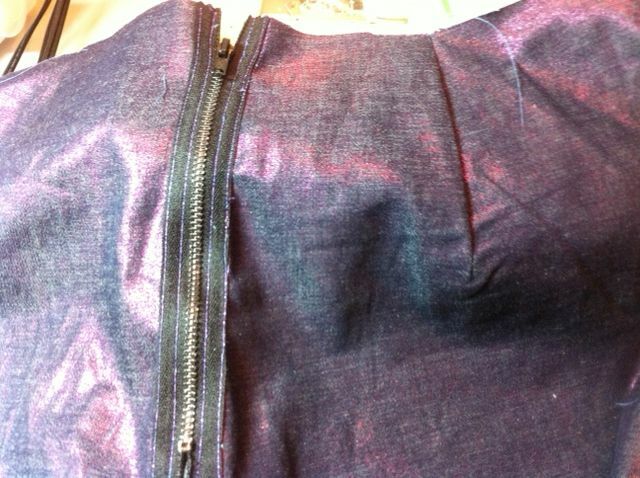 Since the fabric was so subduedI decided to kick it up by adding an exposed zipper to the back. I top-stitched the zipper in Purple, metallic thread. I made three muslins and sent photos to Glenda. She was patient, and encouraging. I was ready to quit. I was disheartened about how ugly my body looked. But my third “muslin” made from some royal blue bottom weight cotton poplin, turned out very nicely. So nicely that when I return form my Christmas trip to Dallas I plan to insert a matching zipper, I used a pink one that was in my stash. And I will finish them. I will remove the waistband and do the faced waist. I bought 8 meters of this fabric. 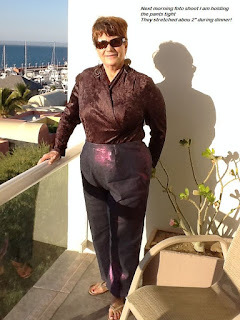 I am thinking of making the asymmetrical blouse from one of Glenda’s books, Sew Sensational Shirts but I will reduce the flounce or remove it. And I will either use a contrast on the flounce or embroider it. 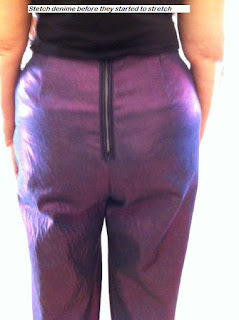 Back to the purple metallic, stretch denim pants. I don’t usually parade my petite derriere on the internet, but in the interests of science, I am showing you the superb fit I obtained. We had a lovely dinner, and thankfully we were staying at the hotel that night. It seems like the wine and the dessert Tequila was especially strong. 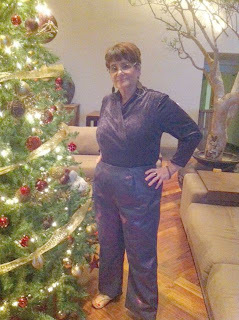 After a three-hour dinner, I stood up and almost lost my Purple pants, they had stretched so much! 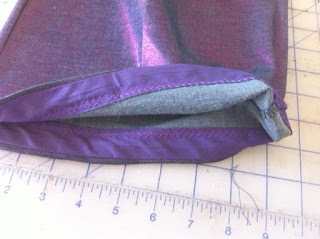 In this photo I am pinching the fabric tightly to hide the bags from the stretch. Glenda advised me to make concave darts to allow space for my curves. And to also widen the darts after the first fitting. 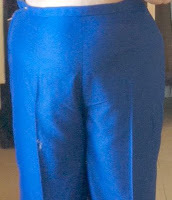 My waist is considerably smaller than my hips, and I like to accentuate it. So I did widen the darts to over an inch to accommodate my curves. 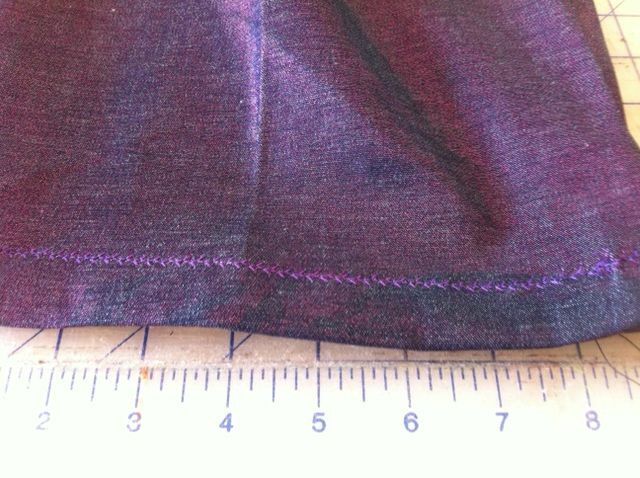 I also tapered both the inseam and side seams 3/8” because of the stretchability of the fabric. My measuring assistants were my maid and my Beloved. 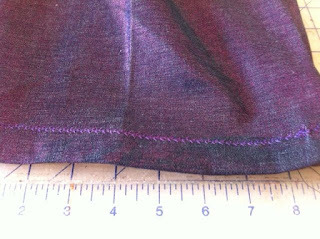 Somehow I made the pants the perfect length, BEFORE hemming so I made a false hem using Purple bias tape. The fabric was so stiff and stretchy, this is probably the best hem finish. I am very happy with these pants. The top is Vogue 8323. I uses the faux wrap top view and added long sleeves. The fabric is a stretch faux panther print. I thought it was velvet, but on closer examination it is some other artificial fiber. Over all it is a wonderful outfit for the holidays. I will have to wet the pants and dry them to get the fabric to tighten up. 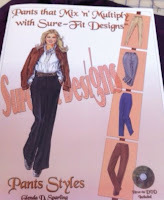 I am completely sold on Sure-Fit Designs(SFD), and I am looking forward to returning home and sewing for the SWAP contest on Artisan’s Square, and entering Pattern Review contests, using my SFD patterns. Glenda’s online videos, and the DVDs that accompany the kits are wonderful. She is accessible and helpful. Merry Christmas, Happy Chanukkah, Happy Kwanzaa and I hope to see you soon on line. 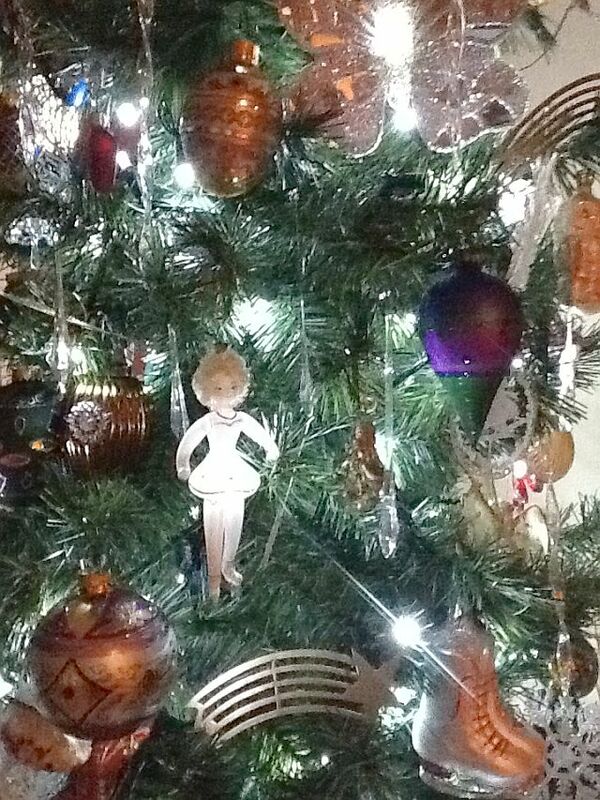 My favorite Christmas ornament, an Italian glass figure skater, back in the Old Country I loved to ice skate! 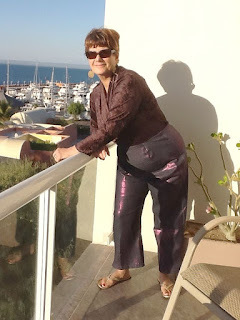 Hi Sue, Great post, and yes your end-of-the-world pants look great on you. I know you struggled, but the end result was worth it. Just a word of caution, if you're planning on sewing the asymmetrical wrap blouse from Sew Sensational Shirts, make sure to use soft, drapable fabric. You may have bought lots of the bottom weight you used for the blue pants, but it will likely be too stiff for this style of top. Have a wonderful Christmas and festive trip to Dallas. Your pants have turned out lovely. Great fabric. I was looking at the SFD system but thought it very similar to the lutterloh system which I have already but had difficulties with it. Do you find them similar – which is better? Great looking outfit Susan and you achieved a great fit! Happy Holidays!